Limahuli Garden and Preserve is set in a verdant tropical valley on the north shore of the Hawaiian Island of Kaua`i. Against a backdrop of majestic Makana Mountain, the garden overlooks the Pacific Ocean. Hawaii is hosting the World Conservation Congress. Thousands of government officials, environmental activists, business leaders and other delegates from nearly 200 countries are in Honolulu for 10 days to shape the direction of global conservation and sustainable development. This is the first time the eco-summit is being held in the U.S. Organizers say one of the reasons the Aloha state was chosen to host the quadrennial conference is because it’s been a model for incorporating indigenous culture into its conservation initiatives. A shining example of this is Limahuli Garden and Preserve, on the island of Kauai. Its director, Kawika Winter, points to the evidence of successful, sustainable farming in the verdant tropical valley. "You see all these terraces that are remnants of the ancient agricultural complex that dates back almost a thousand years. So the original inhabitants of this valley built these walls and left them to be able to grow taro on the land." Kawika Winter gives a tour of the garden to a group of environmental journalists. Winter notes while most of Hawaii’s food is now imported, once upon a time, valleys like this one nourished the whole community. "If you're to take the time to walk through the jungle over here, you’d find terrace after terrace after terrace, all the way down to the ocean. So this valley was definitely feeding a lot of people in the old days." In fact, its name - Limahuli - in Hawaiian, means turning hands, and Winter says it might refer to the people who once turned their hands here to work the earth. Limahuli Garden and Preserve is one of four gardens in Hawaii run by the National Tropical Botanical Garden. 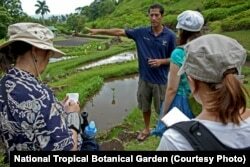 Winter says it’s also one of the few places in the state where people can learn how to manage resources based on the ancient Hawaiian ahupua`a system. He explains, "An ahupua’a is basically a land section that extends from the top of the mountains, out into the ocean and it’s within the borders of an ahupua’a that Hawaiian communities were developed and managed." 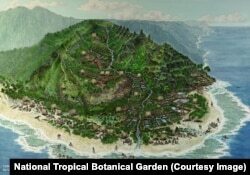 Artist's depiction of what the area around Limahuli might have looked like many years ago. Limahuli's approach gives it a leading role in saving native species. Hawaii is the endangered species capital of the U.S., if not the world. There are more endangered species per square kilometer on these islands than any other place on the planet, and Winter says nearly 40 of them are in 400 protected hectares of Limahuli's garden and nature preserve. "We’re working to do ecological restoration to prevent extinction of this precious biodiversity that exists in this valley," Winter says. "Some of the species are only existing in this valley, and some of them are down to a few individuals in the wild." The Hawaii botanist says he hopes that by coming to Limahuli, visitors will learn some valuable lessons from the ancient Hawaiians who worked this land: whatever you do on the land affects the life and ecosystem of the ocean, and that fresh water is the secret to everything. 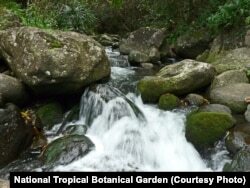 One of the last pristine waterways left in the Islands runs through the garden. Limahuli Stream is one of the few pristine waterways left in the Hawaiian Islands. At more than 1,000 workshops and panel discussions, delegates to the World Conservation Congress are focusing on the theme of our planet at the crossroads, with topics ranging from species recovery and eco-tourism, to indigenous peoples and megacities and watersheds. Kawika Winter believes Limahuli Garden and Preserve can show the world how to care for the planet. "From our perspective, instead of reinventing the wheel, all we need to do is look back to a system that worked in Hawaii for at least a millennium and quite possibly more. And our hope is that we can be a model of sustainability and we can show that the ahupua’a system can offer viable solutions to our contemporary issues regarding sustainability in Hawaii and the globe."